Capped Bust Half Eagles - New Improved Design! The Capped Bust Half Eagle (Heraldic Eagle reverse) was adopted after the small eagle reverse had failed miserably. Robert Scot changed the design to hopefully gain public approval. This series was produced from 1795 to 1807 and was fairly popular among critics. 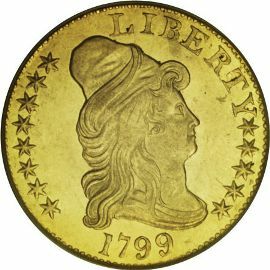 The obverse of these rare gold coins features a portrait of Liberty wearing a cap. Above the design, reads the inscription "LIBERTY" and below it the date. From thirteen to fifteen stars encompass the remainder of the coins edge. 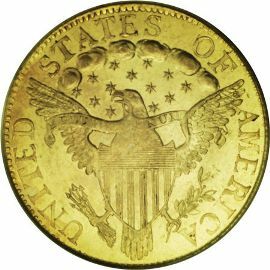 The reverse of this five dollar gold coin is of a heraldic eagle motif that is based on The Great Seal of the United States. The eagle, with its wings outspread, has a row of clouds from wingtip to wingtip. Below the clouds, thirteen 6-pointed stars shine brightly. Also, the eagle is holding a bundle of arrows in its right claw and an olive branch in its left.